Planning is underway to restore Thompson Rivers University’s Astronomy Walk, a signed tour route that once stretched from Old Main all the way to Merritt and beyond. The tour was made up of the sun, nine planets (including Pluto), a nearby star and several galaxies. It was officially opened in 2006 – an event that included an acknowledgement by sci-fi author and inventor Arthur C. Clarke, who supplied an audio message that was played at the tour’s launch. A viewing of 2001: A Space Odyssey, which Clarke wrote with Stanley Kubrick, followed the launch. The walk started just outside of Old Main, with the distances between planets to scale, stretching all the way across campus. Beyond campus was Proxima Centauri near the Millennium Trail on the North Shore, Leo I and II in Williams Lake and 100 Mile House, the Large Magellanic Cloud in Ashcroft, the Small Magellanic Cloud in Merritt and Ursa Minor in Chase. “It’s one thing to learn facts and figures about the universe, but quite another to actually experience the scales involved. This is where the Astronomy Walk makes a big difference: it gives us a sense of perspective as nothing else can,” said Clarke from his home in Sri Lanka at the 2006 launch of the event. Although the walk began with great fanfare, it soon fell into disrepair. By 2014, many of the planets and features were cracked or broken, some were vandalized and some were completely missing. The surviving features on campus were removed earlier this year, but plans are underway to restore the walk to what it once was. 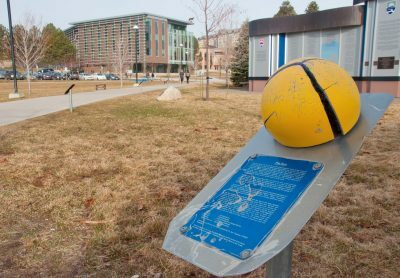 Brandon Dallamore of TRU Facilities has been working with science faculty to come up with a plan for a new Astronomy Walk. “We’re looking to tie-in students to help us design the best locations for the new planets. Maybe some arts students to help us design them – hopefully something sustainable that would last for a long time,” Dallamore said. The group met for the first time on Oct. 20. “We really look forward to having it back. The science faculty was a bit dismayed when we had to get rid of it, but then they took a closer look and realized it was pretty decrepit,” he said. The group has started with a small budget and is seeking further funding through various university departments. Although planning is still in the very early stages, the current timeline will see the project completed by summer 2017. Students interested in contributing ideas or research to the project can contact Brandon Dallamore at bdallamore@tru.ca to express their interest.